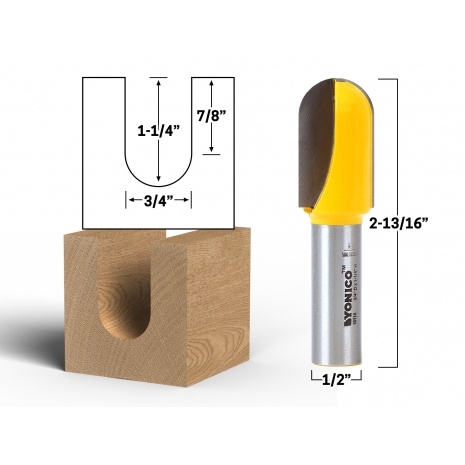 This core box bit features a rounded tip with a 3/8" radius and a 3/4" cutting diameter. The cutting depth is 1-1/4" and the shank is 1/2". Core box bits have rounded tips that are perfect for routing channels in cutting boards and producing flutes in columns using solid wood or MDF. Our core box bits are available in various diameters, with a choice of 1/4" and 1/2" shanks. The smaller shank diameter works well in laminate trimmers, while the 1/2" shanks are ideal for deep cuts with full-size routers.